Maybe you’re visiting Berlin for a longer time period – or maybe you even moved here for good? Anyways – this ‘trash section’ is probably only of interest, if you have your own apartment, equipped with electric and electronic devices of various kinds. And then some fine day one of those electronic devices breaks down and you want to throw it away. But where can you dump your old computer, TV set, stereo system in Berlin? 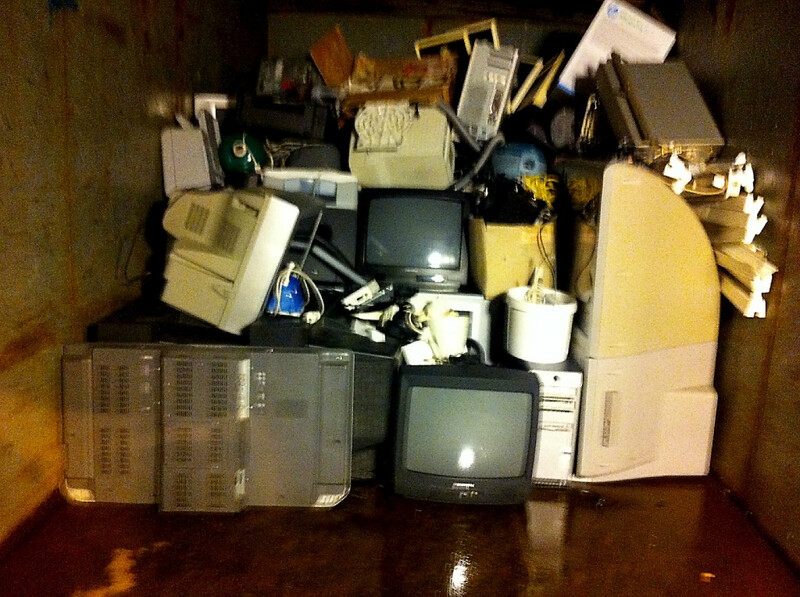 If you happen to have a broken electronic device – be it television set, mobile phone, computer or stereo system – you can just bring it to one of the BSR Recycling Centers. Yes: it’s free of charge – you can just leave it there – no questions asked.Alternatively you can bring it to one of these larger hardware stores (Baumarkt): Globus, Hellweg, Hornbach, Toom – you will find the complete list of hardware stores accepting broken electronic devices on this page. And if you happen to have a broken large device like a fridge or a washing machines you don’t even have to worry about how to get it to the dump site. The Berlin recycling service BSR will come around and pick it up. Best of all: this service is also free of charge. You will find further information (in German) on this page: www.bsr.de/12807.html The telephone number of the BSR service hotline is 030 7592-4900. Too good to be thrown away? If your electric appliances or electronic devices are still working, but you still want to get rid of them, you can either donate them to one of the many charitable institutions – or you can give it away through this website “Tausch- und Verschenkmarkt” provided by BSR. Important note: energy saving light bulbs (neon and LED) are considered electronic trash and are not supposed to be dumped in the regular trash bins you find in your back yard! Instead you can leave them at any shop that sells energy saving light bulbs.